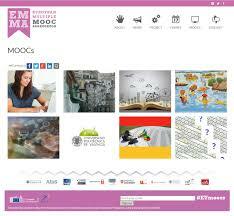 Monday 20th October sees the launch of the EMM MOOC platform (see http://project.europeanmoocs.eu/first-european-multilingual-moocs-go-live-sign-up-now/). showcase excellence in innovative teaching methodologies and learning approaches through the large-scale piloting of MOOCs on different subjects. EMMA will provide a system for the delivery of free, viagra open, rx online courses in multiple languages from different European universities to help preserve Europe’s rich cultural, prostate educational and linguistic heritage and to promote real cross-cultural and multi-lingual learning. EMMA will operate in two main modes; as an aggregator and hosting system of courses produced by European universities; and as a system that enables learners to construct their own courses using units from MOOCs as building blocks. The EMMA team are taking a deliberate multi-lingual, multi-cultural approach to learning by offering inbuilt translation and transcription services for courses hosted on the platform. Ten difference MOOCs are being launched (see http://platform.europeanmoocs.eu/courses.php), with topics as diverse as Climate change and pedagogies. The MOOCs are typically between six and eight weeks long, with about 3 -4 hours of learning required each week. The MOOCs contain content and videos, as well as guided activities and the opportunity to communicate with other MOOC participants via forums and blogs. The MOOCs consist of core and extension materials and a clear indication of the amount of time needed to complete each section is given. The University of Leicester is launching two eight-week MOOCs on Monday 20th October: Technology-Enhanced Learning and Learning Design. I am very excited to be part of this project and I am looking forward to participating in the two MOOCs we are offering. So if you haven’t already signed up, do it now! I am doing a keynote this afternoon at the elene2learn conference in Barcelona. The programme can be found here. I will focus on the notion of disruptive education and will argue that teachers and learners need new digital literacies to harness the potential of technologies. 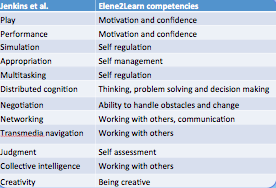 I have mapped the nine elene2learn competencies to the digital literacies described by Jenkins et al. The elene2learn ‘How to guide’ outlines the nine competencies and includes over 40 case studies of the use of technology for learning, in each case providing a map of which competencies are developed and which technologies are used. Well worth a read. You are currently browsing the e4innovation weblog archives for October, 2014.